All photography by Riana Lisbeth. Tara and Kris met on Tinder during the first week Tara was trying out the dating app. He was her third date since signing up for Tinder. They got engaged in January 2016 in their house after a ski trip where Tara, a fan of snowboarding, tried skiing for the first time in many years. They started planning the wedding shortly after. 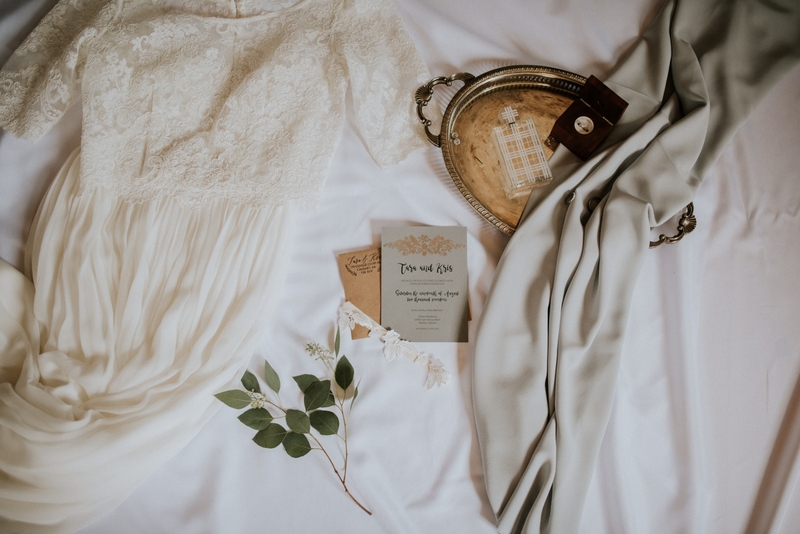 Similar to their low-key engagement, the couple wanted to throw a wedding without restriction where all their friends would enjoy their time. 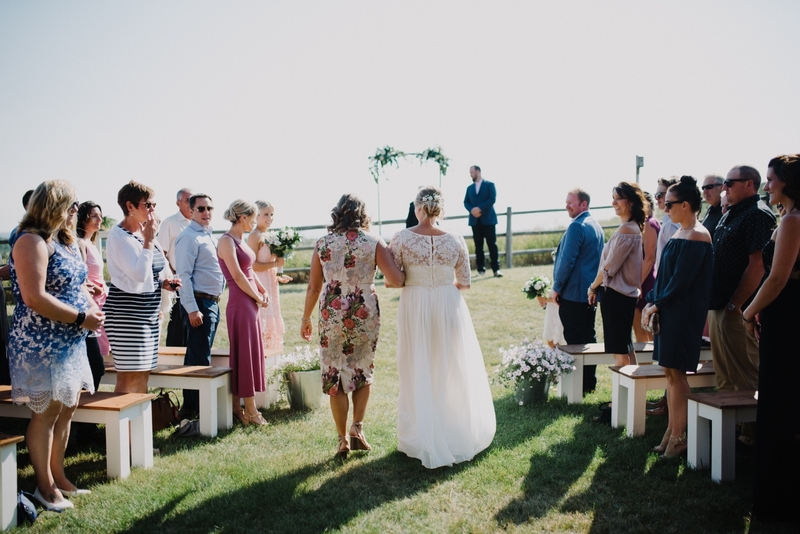 Tara said for their wedding they envisioned “the best party we’ll ever host.” And looking for something non-restrictive, Tara says she was put off by what a lot of wedding venues were offering. 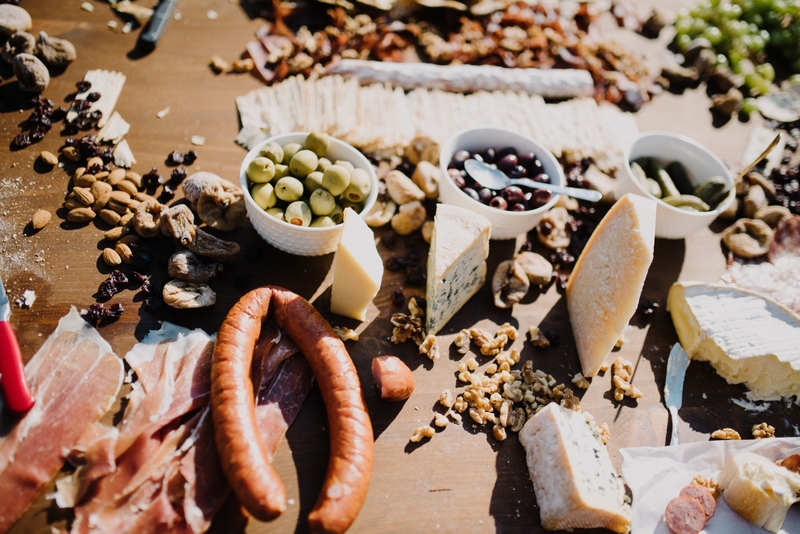 “We wanted to pick our own wine and beer and decoration that really suited us,” she says. Tara is from Toronto and Kris is from Vancouver and the couple chose to host their 60-person wedding in Calgary to celebrate their new life. 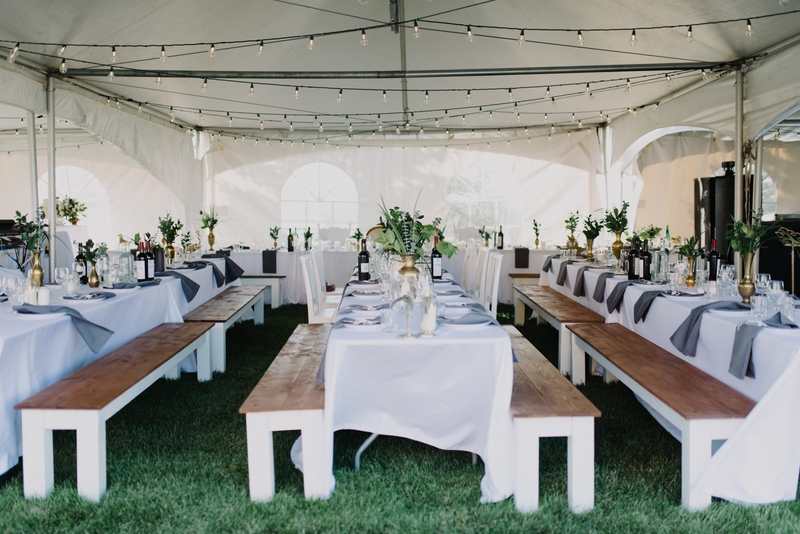 Things came together when Kris’ boss offered his acreage in Okotoks for them to host the wedding. 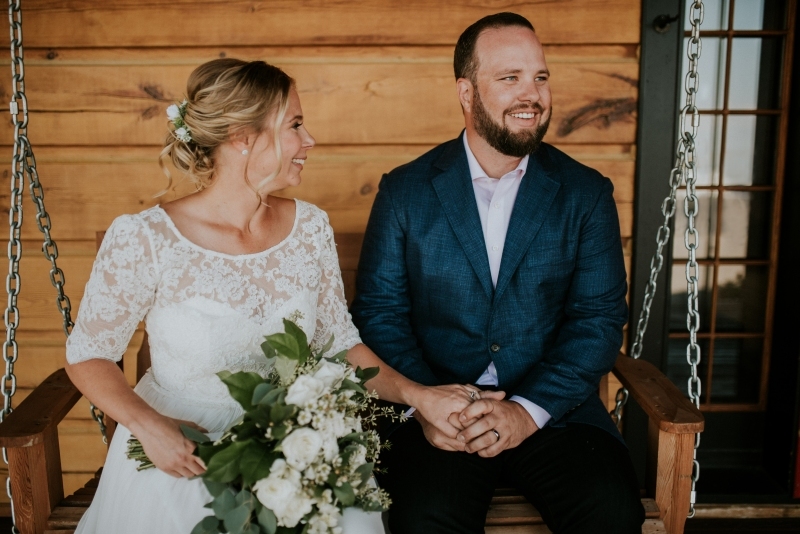 From there, the couple handpicked the decoration from thrift stores, bought local wine and beer like Cochrane-based Half Hitch Brewing, and Tara’s friends made the cake and decorated with flowers left over from the home-made bouquets. They served dinner from Big T’s BBQ and opted out of a traditional bridal party. They later served popcorn as a midnight snack. Tara and Kris even made the benches they used, the altar, and the bar themselves. 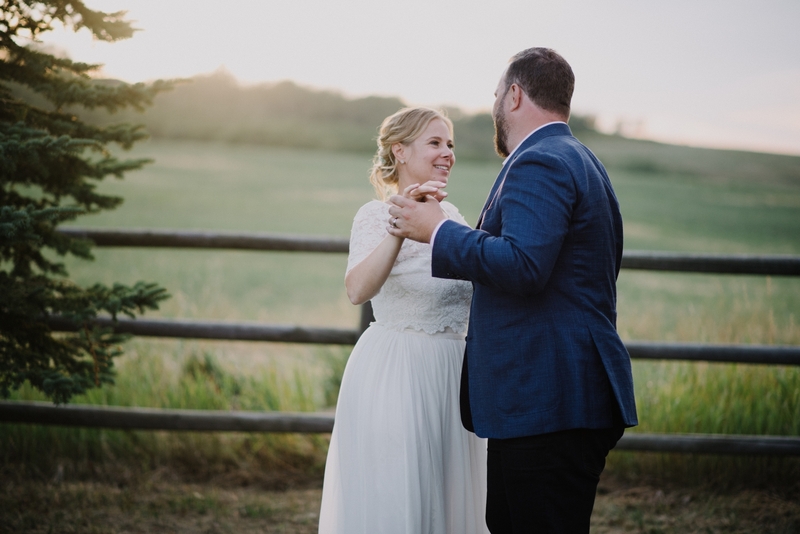 In August 2017, Calgary skies were often grey with smoke from forest fires but the day of the wedding was clear, blue skies, letting for a view of the mountains. Tara says the highlight of the day was how much fun everyone had at their wedding and the generosity of their friends that made the wedding possible the way Tara and Kris wanted. “Everyone wanted to be there and nothing was forced. And everybody had a time. I don’t think there was a sober person there,” says Tara. 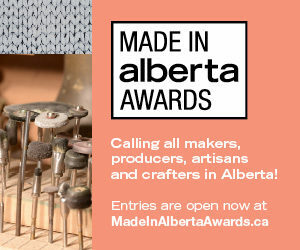 Tara purchased her dress directly from the designer in New York City after trying it on in Calgary. Tara was walked down the aisle by her mom and she opted out of a bridal party. The ceremony was held at an acreage in Okotoks owned by Tara and Kris’ friends. The couple picked the decorations from thrift store around town and made the benches themselves. Dinner was served by Big T’s BBQ and popcorn was brought out later on for a midnight snack. The cake and the bouquets were both made by friends. The couple said help from their friends made their perfect wedding day possible.